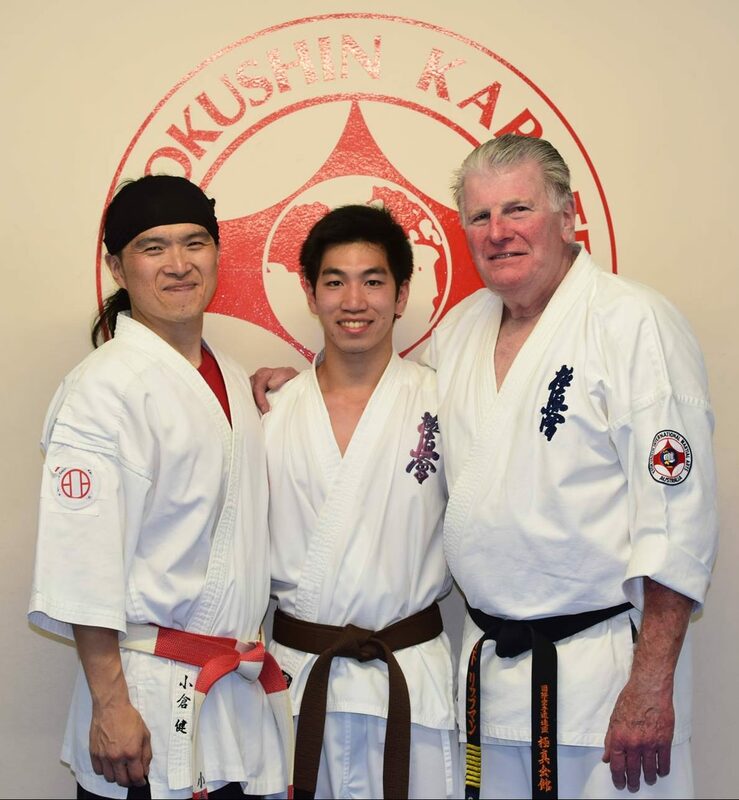 Jonathan Lee with Shihan Ken Ogura and Shihan Howard Lipman at the 2016 Shihan Ken Seminar. Over the years I have read many essays written by students as part of their requirements for black belt. 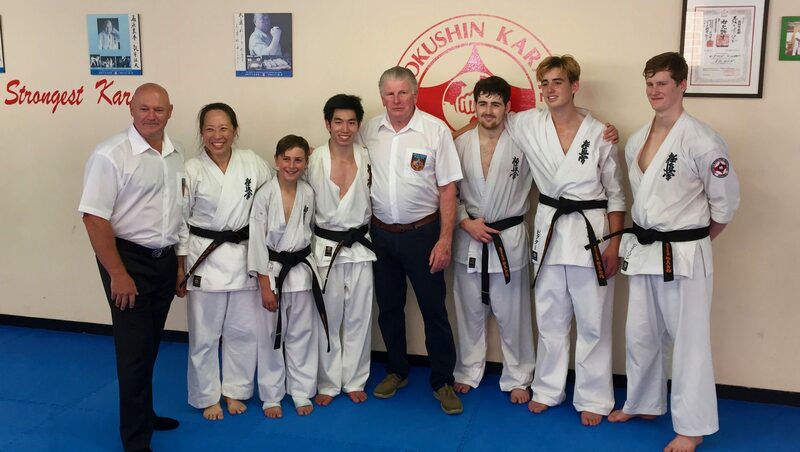 Many different facets of Kyokushin have been explored by these students, ranging from discussions on technique to training methods, and what they hope to achieve in their future in Kyokushin Karate. To the dedicated student, simply put, Kyokushin becomes a way of life and for me personally to this point, it has spanned 46 years. 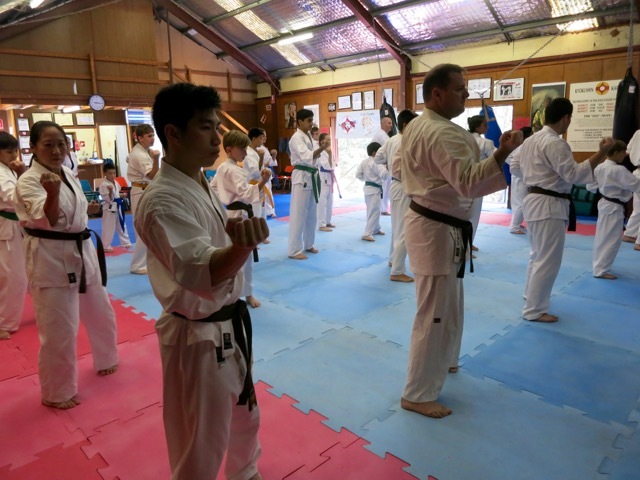 The essay submitted by Jonathan Lee of Turramurra Dojo, prior to his Shodan grading on December 3rd 2016, is one I would advise all Kyokushin students to read thoroughly, and absorb the salient points within. The essay’s title is “Perseverance” and this, combined with introspection on Jonathan’s part, reveals the thoughts that go through the mind of a dedicated karateka. As Jonathan’s essay explores, the learning never stops. An essay written by Sempai Jonathan Lee for his Shodan Grading (December 2016). Mastering the road to black belt is no small feat, nor is the path an easy journey. It requires dedication, commitment, passion, tolerance, patience, physical and mental strength and, most of all, perseverance. Perseverance is one of the most important qualities for the karateka to have in their Kyokushin journey, a quality which permeates all aspects of this martial art. Perseverance keeps us karateka focused on the goal, lets us master our techniques and strengthens our mental fortitude for what is to come. A common saying in all martial arts is that a “black belt is simply a white belt that refused to give up”. My journey to black belt hasn’t been an easy one, with many setbacks and injuries, but that hasn’t stopped me from wanting to achieve this milestone in life. Perseverance is a powerful quality in a person, and is something everyone has but can be developed further through time and experience. The journey to black belt has been a long one for me, almost ten years. Perseverance is an invaluable character trait and can be defined as the ability to face a challenge and to keep pushing forward, one step at a time, regardless of any setback. In the martial arts, it can be that white belt refusing to give up. The ability to keep pushing on, even when faced with a disappointment or failure, is a trait that can make all the difference. 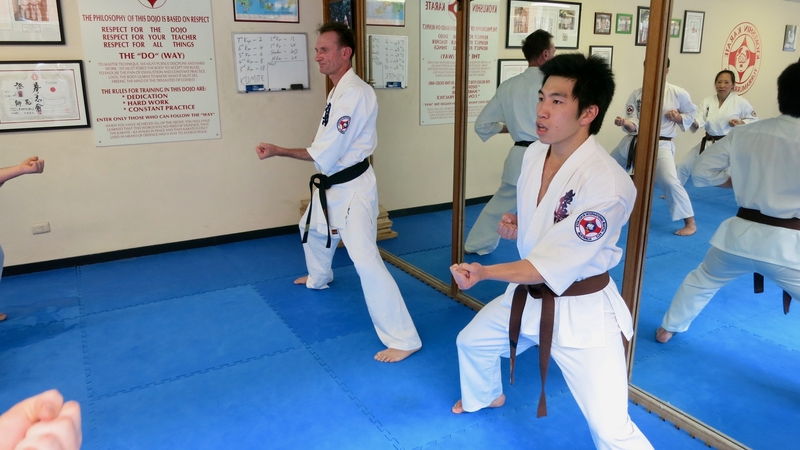 Jonathan Lee in his Shodan grading. Perseverance is an important quality because it makes even the most seemingly impossible task possible. It is what distinguishes the strong from the weak, the successful from the unsuccessful. As a martial artist, perseverance is what keeps you optimistic in times of setback or when you face an obstacle. Instead of seeing the setback as synonymous with failure, a true martial artist sees this as an opportunity where they can grow and learn something new. 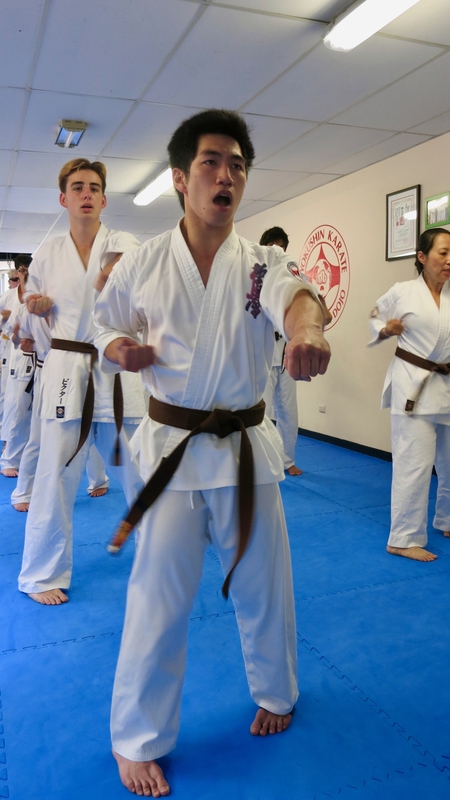 Kyokushin Karate’s belt hierarchy is one such means where students can develop their ability to persevere. When students set a goal to earn their next belt, they come across many challenges along the way and must persist to achieve that goal. As the belts get higher in rank, timing between gradings increase as the road to the next belt becomes harder and harder. In turn, the karateka’s training and application towards their goal must commensurably increase to match; as the goal grows, so must the threshold of the student’s perseverance. We are all taught perseverance at an early age, even if we’re not conscious of it. When a child first learns to stand and walk, they find they fall repeatedly. However, it is natural instinct for them to get back up and try again and again. Despite falling over innumerable times, they ultimately succeed because they persevered. This similar principle can be carried through all aspects of life – especially in Karate. Jonathan Lee leads the grading. One of the eleven sayings (“Zayu no Mei Juichi Kajo”) by Sosai Mas Oyama is that “Following the Martial Way is like scaling a cliff – continue upwards without rest. It demands absolute and unfaltering devotion to the task at hand.” This is what perseverance is all about – the devotion to the seemingly impossible task at hand, the cliff, and exhibiting the persistent effort required to conquer it. 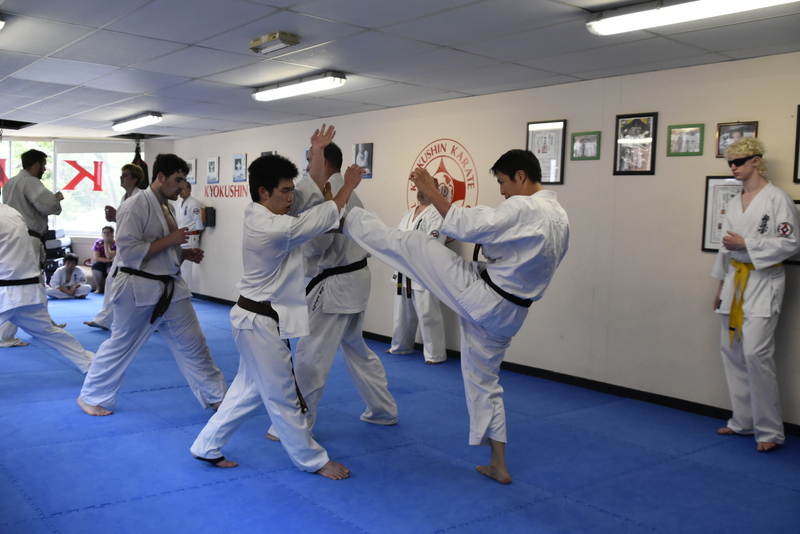 The importance of perseverance is further supported in Kyokushin Karate’s Dojo Kun, where Karateka “train their hearts and bodies for a firm unshaking spirit”. This unshaking spirit is what Kyokushin is all about. 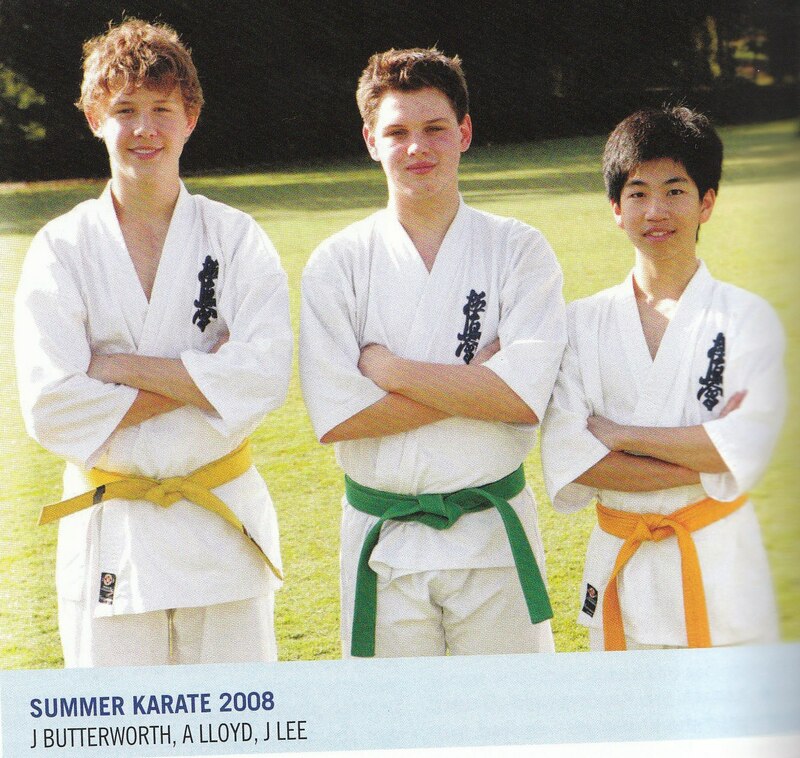 Knox senior students in 2008: James Butterworth, Alex Lloyd & Jonathan Lee. I remember my first day at Karate in 2006. I started Karate as a school sport. I was hooked from the very first session. As most beginners realise, there is so much to take in when you first learn basics (“kihon”) – everything from listening to Japanese customs to the various techniques and stances you’re required to move in. My best friend was one of the reasons I started Kyokushin Karate. He inspired me to follow my dreams of becoming a true martial artist and to this day continues to push me to be better every day. He has been with me since day one, and always my senior student (“Sempai”) who would teach me extra moves during school so that I could perfect everything for class. However, “perfect” is a term that seems impossible to reach and, as I’m constantly told, black belt is only the beginning. These past ten years have taught me valuable life lessons which have been fundamental in shaping who I am today. They have taught me qualities such as patience, integrity, respect and perseverance. These aren’t qualities which can be bought or built overnight. Many who have trained with me can attest to the number of injuries and setbacks I’ve had on my journey to black belt. Jono and other students at a KIMAA seminar. One of the biggest setbacks I’ve faced is the tearing of my left anterior cruciate ligament (ACL) in 2013. I’d achieved my 1st Kyu the previous year and was in training for the black belt grading. The injury was a major setback for me, both physically and mentally. After a three-hour surgery, I woke and had a surge of motivation. My uncle is a 3rd Dan (“Sandan”) in Kung Fu, so becoming a black belt in martial arts had been a childhood dream. This became a focused goal when I began Karate at Turramurra Dojo. I was not going to let any setback stop me from becoming a Kyokushin 1st Dan (“Shodan”). It was a life-changing moment because I decided I wasn’t going to give up on my dream. This gave me a renewed determination to succeed. I spent countless hours learning to walk again, performing drills with resistance bands along with stretching and other exercises to rehabilitate my knee. During this difficult time, I found inspiration in other fighters such as Muhammad Ali. I still turn to this quote often for inspiration in times of upset or hardship: “I hated every minute of training, but I said, ‘Don’t quit. Suffer now and live the rest of your life as a champion.’” It took a year to return to a state where I was capable of training. A year of hard work and rehabilitation felt like an eternity, but after finally coming back to a point of greater fitness than before, I was happy. I was back on track for my black belt. Jono and others performing kata in his Shodan grading. This brings me to my second major setback. In 2015, I was ready again to go for my black belt. Two months away from the grading, I ended up partially tearing both my anterior talofibular ligament (ATL) and calcaneofibular ligament (CFL) during class. After having trained for so long and rehabilitating after my ACL injury, this was another major blow to my motivation. I was devastated as I wouldn’t be able to grade any more. It took me five months of rehabilitation to get back to a stage where I was able to train again. Often during this time I felt like quitting, my motivation was running out. However, I reflected on my journey so far and thought about why I started in the first place. Black belt was a milestone I had always wanted in my life and I knew I had to commit my very being to it if I really wanted it. I realised that the moment when you want to quit, is the moment when you need to keep pushing. This brings me to 2016, the third year running for me to attempt black belt. Two major injuries down, I’ve come back more focused and determined than ever. Jonathan Lee during his 40 fights for Shodan. Despite all these setbacks and injuries, perseverance has been the key for me to continue on this journey. Many people would look at these injuries and have regrets that things didn’t go according to plan but I see them as a valuable lesson – especially from a mental and spiritual point of view. All the setbacks have helped me become a much stronger, more resilient and more persevering person than I would have been if I got my black belt three years ago, and for that I am grateful. This is why I believe perseverance is one of the most important qualities when one embarks on a hard journey such as striving to become a Kyokushin Karate black belt (“yudansha”). When you’ve finally accomplished a goal you can look back at everything and confidently say to yourself, “I persisted, I persevered and now I conquered.” Perseverance is a decision. I look at my scars from my ACL surgery and the brace I wear on my ankle, and have realised they are my tattoos. They remind me of where I’ve been and what I’ve accomplished. I’ve realised that Kyokushin isn’t about how tough my physical body is today, how much pain I’m currently in or how many fights I’ve won. It’s not about the number of stripes on my belt or how long I’ve been doing Karate. Kyokushin has taught me that I have the strength to survive anything that life throws at me – that at the end of the day I will pick myself up and continue on my way. Jono demonstrates finger-tip push-ups for Shodan. As I’ve done Karate over the years, it’s amazing how many people I’ve seen come and go. People who started at the same time as I did but, for whatever reason, took a break and just never got back into it. This pattern serves as a reminder to all karateka who persevere of how far they’ve come. It reminds me of how well I persevered with my goal when others fell by the wayside. That’s what it’s all about – consistent, dedicated effort over the long haul. It’s not about being the strongest or toughest athlete, having good natural balance and flexibility or great reaction speeds. When you start, none of those things matter. What matters is your ability to persevere. This is because in the long run it’s not where you start, it’s where you end up and how you get there that matters. At the end of the day, it’s perseverance which is the secret to success. I have learned that we all have the capacity for perseverance, but to take hold and use it is something learned by an individual through focus, dedication and practice. It’s a type of habit that can be applied in all life situations, whether it’s a challenging task at work or the next belt in Karate. When it comes down to it, the famous baseball player Babe Ruth’s quote couldn’t ring more true, “you just can’t beat the person who never gives up”. 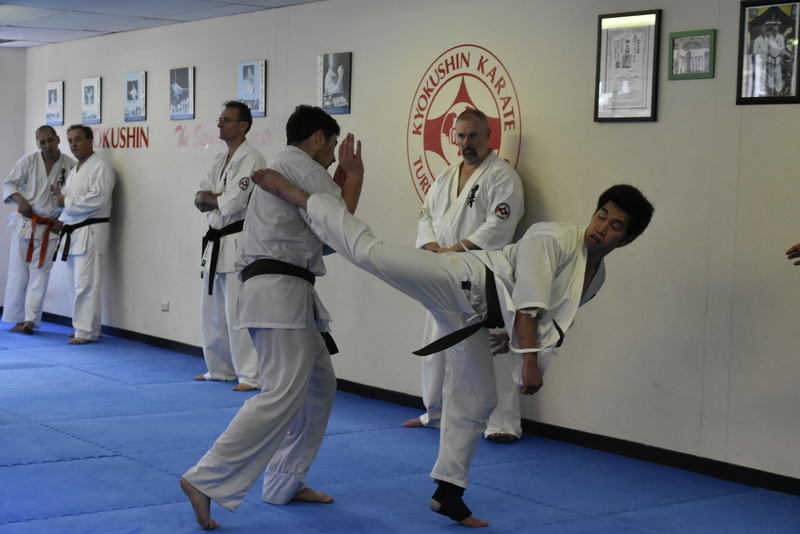 The Kyokushin black belt grading is one of the toughest challenges the karateka can face. The difficulty is so great as successful applicants will be Shodans, demonstrating they have mastered the basics and can properly begin their martial arts journey, down the path of the yudansha. It is a gruelling six-hour test which begins with kihon, combination work of both hand and leg techniques, form (“kata”), self-defence (“kyojitsu”), application of fighting techniques (“oyo bunkai”), stamina and fitness tests, and then lastly an unforgiving set of forty 90-second rounds of full contact fighting “(jiyu kumite”). Understandably, the Shodan grading is not one which is taken lightly – it takes a person who has commitment, passion, physical and mental strength, and a great deal of perseverance to get through it. This special kind of person is one who has decided to devote their life to the martial way (“budo”) and who isn’t afraid of the difficult and arduous journey. This grading isn’t just designed to test one’s martial arts knowledge and skills, but to truly examine who you are when you are physically and mentally exhausted. It is designed to test your decision-making when you’re at your worst as well as your ability to deal with a real situation that might require the use of Karate. At its core, the Shodan grading is testing the principles of a Kyokushin karateka – that is spirit, the will to fight and endure. Perseverance is an important quality that not only helps you attain your goals, but fuels many other valuable traits in a person. It makes you trustworthy in the eyes of others, gaining respect because people know you to be the kind of person who doesn’t quit when faced with challenges. It also helps improve your self-worth and gives a great sense of achievement once a goal is reached. A karateka with perseverance knows that the ability to achieve their goal is within their own hands and that they alone have the choice whether they reach their goal. 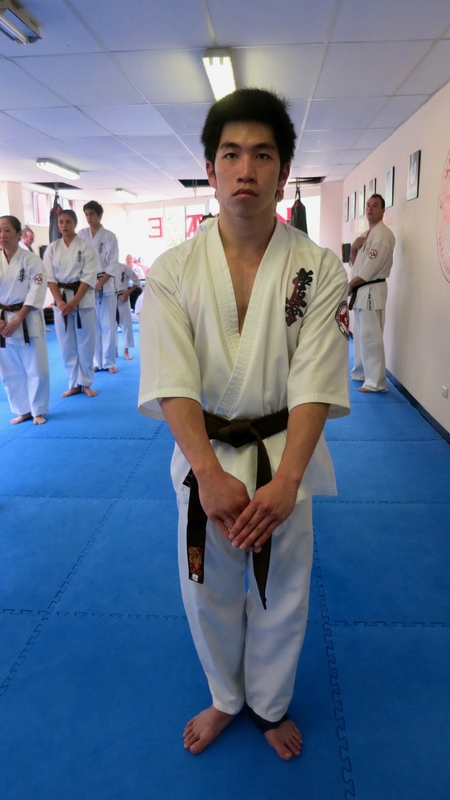 Jonathan just after finishing “Mokuso”, preparing for a senior kata. Having stated the importance and benefits of perseverance, how does one improve it? Perseverance is a quality that everyone has, but to varying degrees. Despite this, it can be trained like a muscle with the right guidance and patience. 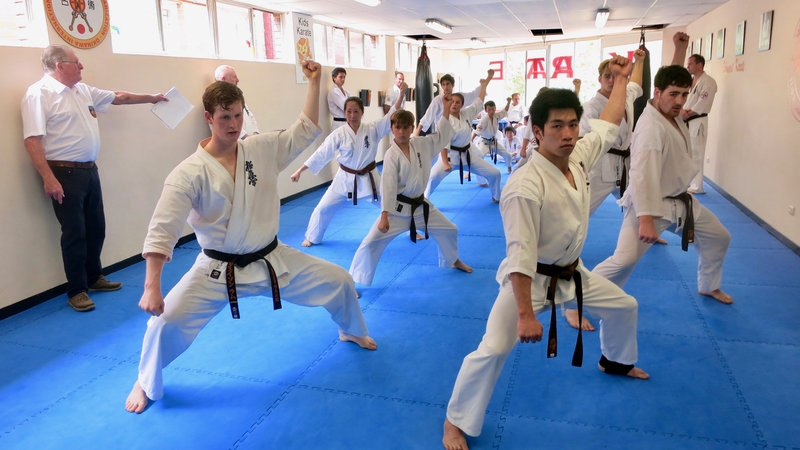 Firstly, at the start and end of each Karate class, students kneel (“seiza”) and meditate (“mokuso”). This is an important time for students to reflect on their goals, their training and what they need to do to improve. Secondly, by starting with smaller goals, students are able to reach their ultimate goal in stages. For example, to learn a head height roundhouse kick (“jodan mawashi geri”), a student may progress from using the wall to assist them as they learn the chamber and pivot, to performing a middle body roundhouse kick to finally a head height roundhouse kick once they’ve developed the flexibility, technique and balance required. By breaking techniques into smaller steps, the larger goal is much easier and the accomplishment of each mini-step will inspire the student to keep up the hard work. Lastly, I found that when faced with a new challenge or whenever I felt discouraged, be it due to injury or other circumstances, it was best to take a step back from everything. By concentrating on the big picture, one realises that the current obstacle is only a small rock on the path to success. Perspective is an important tool and I have found it to be an indispensable skill to have on my road to black belt. Shihan Howard Lipman awards Sempai Jonathan Lee his Shodan, December 2016. Perseverance is an amazing personal quality to develop and will help the karateka in all aspects of life – whether it be at school, work, hobbies and especially Kyokushin. I found it an important trait to develop in my pursuit of black belt and encourage all students to never give up their dreams. I will shortly be undergoing my Shodan grading and I know that it will be a gruelling challenge – particularly the fights. I may be bruised, bleeding and a little broken, but I’m going to get back up every single time . . . because I am Kyokushin. Shihan Howard Lipman and Shihan Rick Cunningham with the new black belts.